What does it take to lure a lapsed player back to World of Warcraft? With subscription numbers slowly-but-surely dropping, Blizzard launches the new Scroll of Resurrection program, granting returning players a free upgrade to the Cataclysm expansion and an instant jump to level 80 — they just need to be asked. 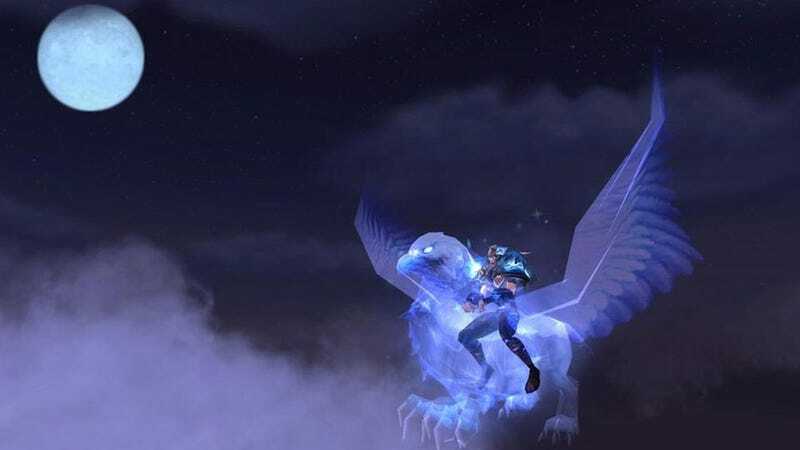 Current World of Warcraft subscribers that use the Scroll of Resurrection to bring back lost friends and guild members will score an epic spectral mount for their troubles one the returning player re-ups their subscription, but that's a pretty hard sell for someone that's moved on to bigger and better things. So Blizzard sweetens the pot for the lapsed subscriber. Once they accept the scroll they'll be instantly updated to the Cataclysm expansion with seven days' free game time and a free server move in case their referrer is on a different realm. What's more, they'll be able to instantly level one character to 80 in order to party with their high level pals. The first thing that comes to mind, of course, is that one could create a new account, use the referral program, and get a mount plus an insta-80 character in one fell swoop. No dice, schemers — the upgrades only work on accounts that went inactive before inactive on or before March 4, 2012. Still, not a bad deal. It's no cross-faction play, but that would have been an unmitigated disaster anyway. And oh hey, I'm lapsed. Perhaps I need a friend to bring me back for one last big score?